What is Kagem Zambian Emerald? You turn the rough, green stone through your fingers. It glitters prettily in the light. Is it a piece of green glass? No, it’s a Kagem Zambian emerald! A member of the beryl family, Kagem Zambian emerald is famous for its breathtaking bright green color with a bluish tinge that captures the refreshing beauty of the spring season. The first known emerald mines were in Egypt, dating from at least 330 BCE to 1700 BCE. Queen Cleopatra was known to have a passion for emerald and used it in her royal adornments. Is Kagem Zambian emerald valuable? The value of colored stones is typically determined by a combination of its color, clarity, cut, and carat weight. This is no different when determining what Kagem Zambian emerald is worth. These guidelines will help you choose emerald stones for your collection. 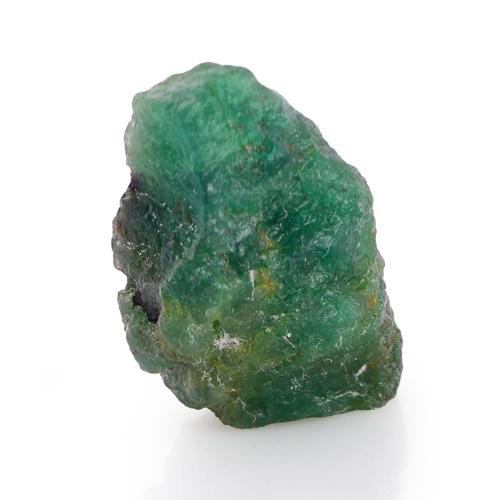 Kagem Zambian emerald is said to have a bright green color, with a blue tinge. It beautifully captures the essence of Spring. The presence of chromium lends a bright green color to the emerald, which if not present will only make a beryl colorless. Iron and vanadium are also present, which give it a bluish tinge. When choosing emerald, the stone’s color is most important. The gemstone favors a deep saturation of color. Kagem Zambian emerald is highly sought after and commands a higher price in today’s market. Emerald belongs to the Type III category of the GIA clarity grading system. Type III gemstones typically contain inclusions that are visible to the unaided eye. In terms of transparency, Kagem Zambian emerald is available in transparent to translucent form. Inclusions are accepted in high-quality emeralds. But, when the inclusions have a negative effect on transparency and clarity, the value of the gemstone reduces dramatically. Kagem Zambian emerald is available in abundance, and it is frequently found in oval, marquise, pear, round and square shapes. The rectangular step cut, commonly known as the “emerald cut,” is good for emerald due to the nature of the stone. The emerald cut helps protect against damage because the vulnerable corners are faceted, providing a comparatively safe place for prongs. However, the cutter must consider the rough stone’s color saturation, durability, and inclusions when making cutting decisions. Due to possible fractures, the cutter must design the cut to minimize their effect on the finished stone. Kagem Zambian emerald comes in a wide range of sizes. Believing in quality-for-quality, the value of emerald can rise dramatically as the size increases. However, the color saturation and clarity play an important role when it comes to the price of the gemstone. The smallest sizes of emerald range from 1 mm to 5 mm, with weights from 0.02 to 0.50 carat. Prestigious pieces of jewelry can include emeralds that weigh over 20 carats! Most gemstones undergo additional treatment to enhance their optical properties, and emerald is no exception. As one of the more popular gems on the market today, these emeralds are subject to treatment for improvement in clarity and color. There are two primary treatment methods that we apply to emerald gemstones. Surface-reaching fractures in emerald are filled with colorless oils or resins to reduce the visibility of the fractures and improve the clarity of the stone. Fracture filling is carefully regulated to make sure sellers comply with industry guidelines. This treatment is not permanent and may need to be maintained by a professional jeweler. In dyeing, a coloring agent is added to the oils or resins used in the fracture filling process. This is done to improve emerald color, giving light-colored beryl an emerald green color. The treatment is not permanent and is rarely done. Kagem Zambian emerald measures 7.5 to 8 on the Mohs scale of hardness and has fair to good toughness, making it a durable stone for regular wear. However, the gemstone should be protected from shocks and scratches. By some estimates, 90-percent or more of emeralds are fracture-filled. Therefore, it’s risky to clean them with ultrasonic or steam cleaners. Ultrasonic vibrations can weaken already-fractured stones, and hot steam can cause oil or unhardened resin to sweat out of fractures. Using lukewarm, soapy water, coupled with gentle scrubbing from a soft bristled brush is the safest way to clean this stone. Rinse your scrubbed stone with fresh, cool water and dry with a soft, lint-free cloth. Heat can also damage emeralds, especially by extending existing fractures. Use of chemicals can cause the oils, resins, and polymers to alter in appearance or deteriorate. In addition, despite good hardness emerald can still be scratched, so it should be wrapped in soft cloth and stored separately from other gemstones. Or, store your jewelry in a lined jewelry box designed exactly for this purpose. Who Can Wear Kagem Zambian Emerald? 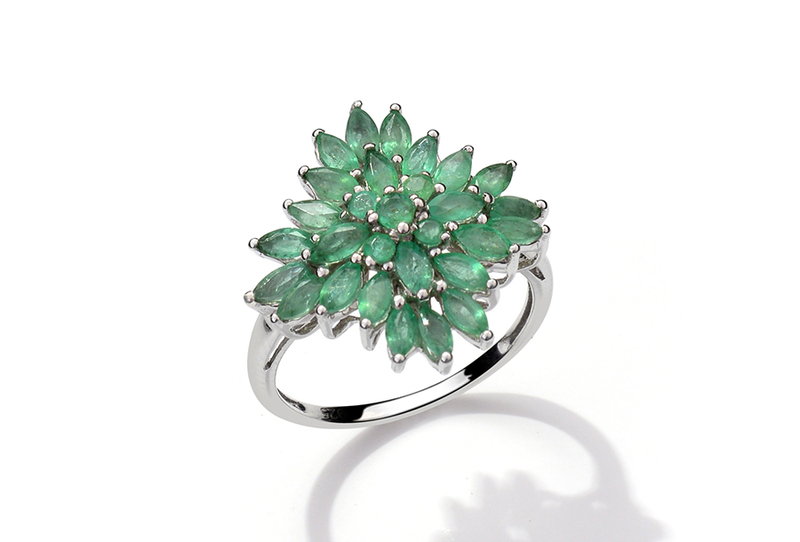 Emerald is a classic gemstone that captures the beauty of Spring. The inspiring tones of this gem are the perfect complement to the stunning colors of Spring and Autumn fashion. The color of life and nature, wealth and rebirth, emerald green is a magical, refined and elegant shade. And the best thing about emerald green is that it flatters literally everyone, regardless of skin tone, hair and eye color, and one’s personal style. 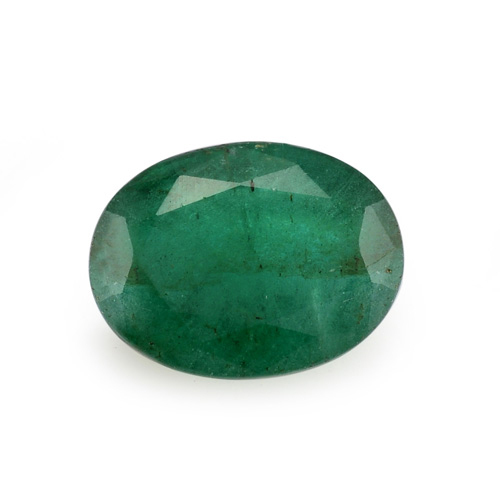 Among royals and celebrities, this gemstone is a favorite choice for necklaces, although this evergreen stone is a contemporary choice for different jewelry styles such as rings, pendants, earrings or brooches. These refreshing hues look best with yellow or rose gold, as does Kagem Zambian emerald! In addition, emerald jewelry is an ideal gift choice for those celebrating their 20th or 35th wedding anniversary. How Does Kagem Zambian Emerald Compare to Other Emerald Stones? Kagem Zambian emerald is prized for displaying a clean and saturated bright green color with a bluish tinge. Most frequently, this gemstone draws a comparison to Columbian emerald which typically displays a warmer and more intense pure green color. Despite the differences, all the varieties of emerald have the potential to display comparable shades of green. Origin alone won’t dictate the color potential within any single gem. Where Does Kagem Zambian Emerald Come From? Shop LC sources this variety of emerald from the Kagem mine located in the southern part of the copper belt province, in the emerald mining area south of Kitwe, Zambia, South Africa. The Kagem Emerald Mine is the world’s single largest producer of emeralds and it accounts for approximately 25% of global emerald production. Emeralds are mined throughout the world. However, the principal deposits of emerald are found in Colombia, Brazil, and Zambia. How is Kagem Zambian Emerald Mined? Emerald is mined through open-pit operation, known as Fwaya-Fwaya–Chama in the local tongue. The operation currently runs to as much as 130 meters in depth, is 1.5 kilometers in length and approximately 750 meters wide. The open-pit mining enables every carat of emerald to be accessible to the miners. In addition, a strip-and-fill method takes place before and after production mining. To extract the mineral, the potential emerald-bearing contact zones are mined. Exposed emerald crystals are removed by hand tools and sent to the sorting plant. The big emerald bearing rocks are transported by trucks to the processing plant for recovery of any emeralds not seen, and are removed by hand tools. The waste material stripped away during the mining is used to fill in an area that is already mined and exhausted—an area called the footwall. This process helps reduce the pit size while contributing to the restoration of the local landscape. What Does Kagem Zambian Emerald Mean? 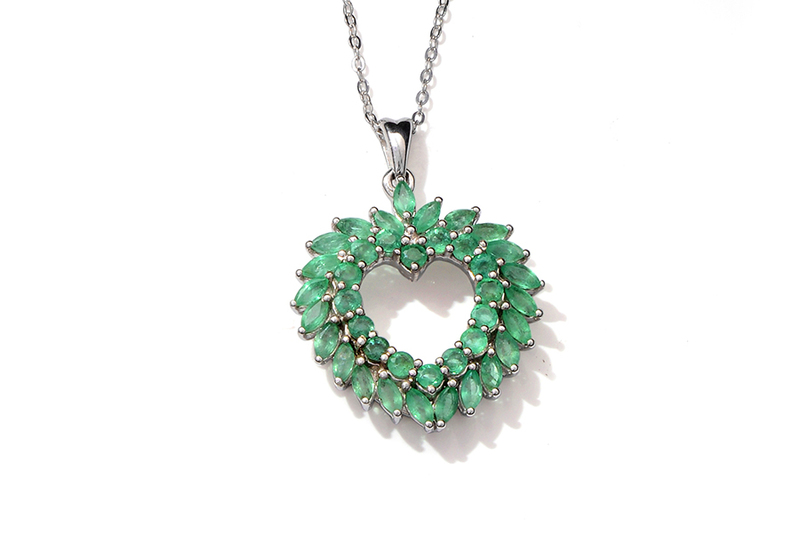 Many therapists believe emerald is a stone that stimulates the heart and the heart chakra. The soothing energy of this gemstone provides healing to all levels of the body, bringing freshness and liveliness to the spirit. It is also believed to promote farsightedness, perceptiveness and mental growth. Others suggest that as the stone of hope and development, emerald embodies fertility and rebirth, and helps you avoid evil spirits. In addition, the gemstone is said to promote healthy relationships by providing domestic bliss, contentment, and loyalty. Is Kagem Zambian Emerald a Birthstone? Emerald is the modern birthstone of May. With its bright green color and a bluish tinge, Kagem Zambian emerald is a welcome addition to this list. Kagem Zambian emerald ranks 7.5 to 8 on the Mohs scale of hardness. Kagem Zambian emerald displays a color range from yellow-green to blue-green including colors like spring green, Kelly green, mint green, forest green, and of course emerald green. Shop LC sources our supply of Kagem Zambian emerald from the Kagem Mines of Zambia. Kagem Zambian emerald is sometimes treated to increase clarity and color through fracture filling and dyeing.